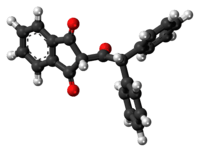 Diphenadione is a vitamin K antagonist that has anticoagulant effects and is used as a rodenticide against rats, mice, voles, ground squirrels and other rodents. The chemical compound is an anti-coagulant with active half-life longer than warfarin and other synthetic indandione anticoagulants. ↑ EXTOXNET Staff (1993-09-01). "Diphacinone". EXTOXNET. Retrieved 2011-12-07. ↑ Bell Laboratories, Inc. July, 1990. Diphacinone Technical: MSDS. Bell Labs, Madison, WI. ↑ Murphy, Michael J.; Talcott, Patricia A. (2013). "Anticoagulant Rodenticides (Ch. 32)". In Peterson, Michael E.; Talcott, Patricia A. Small Animal Toxicology (3rd ed.). St. Louis, MO, US: Elsevier Health Sciences. pp. 435–446, esp. 435–439. ISBN 0323241980. Retrieved 5 April 2016. ↑ Reigart, J. Routt & Roberts, James R. (Eds.) (2013). "Rodenticides (Ch. 18, § Coumarins and Indandiones)" (PDF). Recognition and Management of Pesticide Poisonings (6th ed.). Corvallis, OR, US: National Pesticide Information Center (Oregon State University and the U.S. Environmental Protection Agency. Retrieved 5 April 2016. The first-generation anticoagulants, for example, are reasonably effective against pest rodents and are less toxic than second-generation anticoagulants… / Very small amounts of the extremely toxic rodenticides sodium fluoroacetate, fluoracetamide, strychnine, crimidine, yellow phosphorus, zinc phosphide and thallium sulfate can cause severe and even fatal poisoning. Cholecalciferol is also a highly toxic agent. The anticoagulants, indandiones and red squill, are less hazardous to humans and domestic animals. Some of the newer anticoagulant compounds, termed 'second-generation anticoagulants,' may cause human toxicity at a much lower dose than conventional 'first-generation anticoagulants'… and can bioaccumulate in the liver… CS1 maint: Multiple names: authors list (link) [p. 173, emphasis in source]. "Diphacinone - toxicity, ecological toxicity and regulatory information". Pesticideinfo.org. Retrieved 2011-12-07. An online pesticide database that gives more information about the safety issues associated with use of diphenadione. Reigart, J. Routt & Roberts, James R. (Eds.) (2013). "Rodenticides (Ch. 18, § Coumarins and Indandiones)" (PDF). Recognition and Management of Pesticide Poisonings (6th ed.). Corvallis, OR, US: National Pesticide Information Center (Oregon State University and the U.S. Environmental Protection Agency. pp. 173–187. Retrieved 5 April 2016. CS1 maint: Multiple names: authors list (link) A safety handbook that explains how incidents of poisoning by various rodenticides are treated.